SMC is a mixture of polymer resin, inert fillers, fiber reinforcement, catalysts, pigments, stabilizers, release agents, and thickeners. Manufacturing of SMC is a continuous in-line process. This process produces high strength, complex parts in a wide variety of sizes. Matched metal dies are mounted in a hydraulic molding press. The material charge is manually or robotically placed in the mold; the heated mold halves are closed, and up to 2,000psi of pressure is applied. Cycle time ranges from one to five minutes, depending on part size and thickness. Features such as ribs, bosses and inserts can be molded in. Compression molded fiberglass parts are characterized by net size and shape, two excellent finished surfaces, and outstanding part-to-part repeatability. Trimming and finishing costs are minimal. In-mold coatings and vacuum system in the tool are available to improve surface paint ability, eliminating the need for primer. Male and female tools are commonly made from tool-grade steel. Where pressure is < 400psi, other tooling materials can be used. Tools are generally capable of running temps of 150 degree and pressures about 1000psi (depending on contour of the part). • Good dimensional stability, including excellent thermal resistance. • Pigmentable for molded-in color; best appearance with mold texture. • Excellent property retention in cold and hot environments. • Suitable for outdoor use in applications involving UV exposure and water. 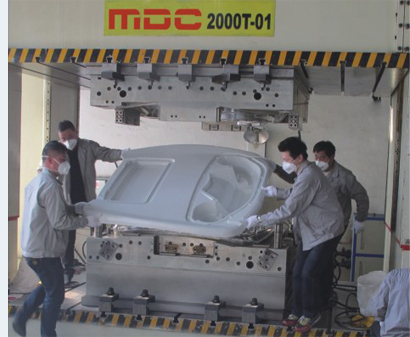 Now SMC molds are our core business and our customers are Mercedes Benz, Audi, GM, etc.